Have you ever wanted to create your own custom time frames in Metatrader 4? I’m going to show you how to do just that with a cool, easy-to-use MT4 period converter. Creating custom chart periods is easy with the free Metatrader 4 platform. Metatrader 4 is an award winning Forex trading platform and is the most popular trading platform on the market today. With Metatrader 4 (MT4), you can create custom trading robots called Expert Advisors (EAs), and you can automatically backtest trading strategies. Users of Metatrader 4 also enjoy a community of traders that program and freely share their own EAs. In fact, most of the custom indicators, scripts, and Expert Advisors are built and distributed by this tech savvy user community. Almost anything can be found, and just about any trading strategy can be programmed. Even with all its flexibility, Metatrader 4 does have its limitations. For one, constant volume charts (also known as tick charts) aren’t available for MT4 by default. I’ve written an article on how to create tick charts in MT4, but I’m still keeping my eye out for a more practical solution. I still haven’t found a single tick chart solution that doesn’t have to be rebuilt each time the custom tick chart or the Metatrader 4 platform is closed. If you switch between profiles often, like I do when I’m trading the Top Dog Trading system, then something like that is simply not practical. That being said, there are some features that Metaquotes (creators of MT4) overlooked that can be implemented fairly easily, and without a big headache from a practical standpoint. One such feature that we can add is custom time frames, using a simple custom indicator for MT4 called a period converter. Note: Metatrader 4 comes with a PeriodConverter script, but it has to be reapplied to your charts every time you restart the platform. The indicator downloaded from this page does not need to be reapplied to your charts after each restart. Step 1 – Download the custom P4L PeriodCon 509 indicator. Step 2 – Move the extracted file to your Indicators folder (File > Open Data Folder > MQL4 > Indicators). Step 3 – Start or restart Metatrader 4. Step 4 – Open a chart of the currency pair that you would like to make a custom time frame for. Step 5 – Open your “Navigator” window (Ctrl+N), if it’s not already open, and drag the custom MT4 period converter onto your desired chart. Step 6 – Adjust your settings under the “Inputs” tab, if needed and click “OK”. 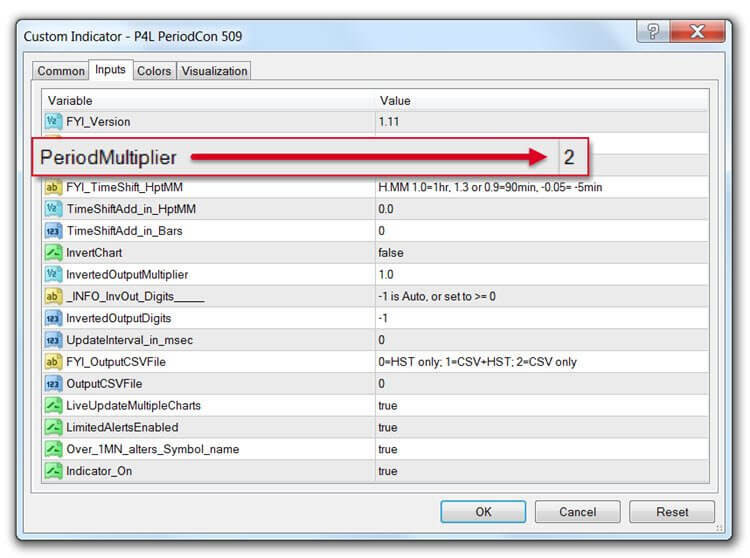 The only setting that most of you will need to adjust is the value for the “PeriodMultiplier” variable. Note: Under the “Common” tab, make sure “Allow DLL imports” is checked or else this indicator will not work. In the picture above, the “PeriodMultiplier” variable is set to a value of 2. This number can be changed to whatever you like. The chart that you apply this indicator to will be multiplied by this number. Example: If you apply the MT4 period converter with the setting of 2 (above) to a 5 minute chart, this would produce a 10 minute chart. If you change “PeriodMultiplier” to 4, that same 5 minute chart will produce a 20 minute chart. You can also add multiple instances of the indicator to one chart. In other words, you could create your 10 minute and 20 minute chart from the same 5 minute chart. You would just have to add two of the period converter indicators to your original 5 minute chart. Step 7 – To use your custom time frames in Metatrader 4, you must find and open them. All of your custom time frames can be found in your offline charts (File > Open Offline). See the picture above. Navigate to and open your newly created custom time frames (see the picture below). Your new custom chart times will stay active, as long as the original chart (the one that you applied the MT4 period converter to) stays open. Important! You must keep the original chart(s) open (the ones that you applied the indicator to) or else your newly created custom time frames will not update in real time. Whenever I’m setting up my charts for the Top Dog Trading system, which uses fractal energy, I need to create groups of 3 custom time frames that are 3 periods apart from each other. Something like this: GBPUSD 8 Hours – 1 Day – 3 Days (8 Hours x 3 = 1 Day x 3 = 3 Days). To accomplish this, I open a GBPUSD chart and select the 4 Hour default time frame in Metatrader 4. Then I apply the custom MT4 period converter to my 4 Hour time frame with the “PeriodMultiplier” variable set to 2. This creates an 8 Hour custom time frame. Since the 1 Day time frame is available by default, I simply need to open a new GBPUSD chart and set it to D1. Next, I apply a second instance of the custom MT4 period converter to my original 4 Hour chart. This time I set the “PeriodMultiplier” to 18, which produces a 3 Day chart. Note: I could also apply the custom period converter to my 1D chart and set the “PeriodMultiplier” to 3 to produce a 3 Day chart. Now, I have a short, medium, and long time frame group for swing trading setups. Lastly, I would save this as a separate profile for this currency, and call it something like GBPUSD 8H-D1-D3 or GBPUSD Swing Trade. This way I can open other charts and profiles, but you can always come back to my custom GBPUSD profile without having to go through these steps again. I personally use a separate profile for each currency and relative time frame (e.g., GBPUSD Short, GBPUSD Medium, GBPUSD Swing Trade, etc…). Note: Although this custom MT4 period converter is a big improvement over the default script, it can still be resource hungry when many custom charts are open at once. Setting up groups of custom chart times in separate profiles can save you some headaches, and your CPU will thank you. Multiple time frame trading is a popular technique. It’s great for timing entry triggers and making fractal energy observations. It’s essential to set up your charts this way when using the Top Dog Trading method. I use custom chart periods regularly, so I figured you might find this guide helpful. Now you know how to create your own custom time frames for Metatrader 4 by using this free MT4 period converter. If you have any questions, please leave a comment. I’m happy to answer them. will it convert to a seconds chart ? and how please let me know . Actually, Metatrader will only go as low as 1 minute. As far as I know, Oanda has a proprietary charting software that goes as low as 5 seconds, and I think they’re the only broker who offers such a thing. Google “oanda seconds chart,” and you’ll see what I mean. Can your solution be used on the 5 sec Oanda charts to create 1 second Oanda charts. Or is the 5 sec a predetermined limitation by Oanda the same way MT4 limits to 1 min? This indicator is designed for MT4. Also, it multiplies your time-frame. It will not divide a time-frame. Thanks, James. I’ve added a link to it in case you guys want to give it a shot. hi Chris thanks so much. But i would like to ask. Can an EA run on the offline chartS? I’ve used them on offline charts before, but I’ve heard it both ways. I guess it depends on the EA. If it’s an EA that just needs to be run on the chart you are using, you could always just open another regular chart for your pair to run the EA on. Also, the reason people usually say that EA’s don’t work on offline charts is because the offline charts don’t receive tick data, but this period converter gives the offline charts that you create tick data, so… I think most EA’s should work. Do you see what I’m saying? You are essentially creating active, custom charts out of offline charts using the period converter. My guess is that any EA should work on these. The few that I use do. You mean I must open regular chart with EA if I want to use offline chart with EA? For example, if I want to use 2 hour chart with EA, I should open 1 hour chart with EA? It this case, EA is working for what chart? 1 hour or 2 hours? You’re welcome. Glad I can help you. Thanks, this indicator is really useful. Yes. This updated indicator (on this page) has a time shift feature. Take a look at the options under the “Inputs” tab. You can see them all in the first image of this article (not including any ads). You should be able to do what you are wanting to do with this indicator. thanks for the converter. does the offline chart need to be continually refreshed or will it update just like a regular chart? I can’t seem to get it to give me real time data without refreshing. It gives you real time data (no need to refresh), but you have to keep the base chart open. In other words, if you’re multiplying a 5M chart by 4 to get a 20M chart, you have to keep the 5M chart open (with the converter attached). Go to scripts in mt4 and there is exactly the same period converter that you can drag on to your chart , then open offline chart with converted time. Thanks for commenting. The PeriodConverter script that comes with Metatrader 4 has to be reapplied every time you start the platform up again. The indicator on this page doesn’t need to be reapplied each time. As for your second statement, I’ve created an article on how to create tick charts in MT4, but that is not a default feature. Of course, I’m talking about full tick (also known as constant volume) bar or candlestick charts – not the little tick chart in your order window. Jerry, that sounds like a software conflict, or possibly a memory problem on your computer. Yeah. Sorry about that. I recently updated this article. There were still some old instructions for the original indicator that was downloadable from this page, although I had already switched the download to a new, working indicator. I hope you got it working anyway. This period indicator does not seem to work on the new build 604. Any advice to make it operational? I want to activate my Renko Charts on a 2 minute offline chart. Dave, sorry for the late response. I had to update this page with a working indicator recently. It should work for you now. I hope you haven’t given up. Hi I am having problems with getting this indicator to work on my MT4 I put it in the experts/ indicator file close and reopen my MT4 see it on the customized list of indicators put when I click on it or drag it nothing happens? please help? I found the answer on a different blog: Because of the new mt4 upgrade to 600+ i think thats why its not working.. But the period converter thats in the code base of your mt4 platform work .. Its under the scripts section .. I just tried it out and works .. Thanks for your comment. Unfortunately, the PeriodConverter script that comes with Metatrader 4 needs to be reapplied to your charts each time you reopen the platform. The new indicator that I’ve uploaded to this page does not need to be reapplied, and it works in the newest builds of MT4 as well. You always have to use offline charts when creating new timeframes, but they should work just like your regular charts. As far as switching profiles goes… I do this all the time without a problem. 1. Make sure you’re using the custom MT4 period converter from this page – NOT the PeriodConverter script that comes with MT4. 2. Make sure you save your profiles, and be sure you’ve included the original chart that has the custom period converter attached to it. Hope that helps. Let me know if you’re still having trouble. It’s so frustrating that MT4 creates a distinction between ‘standard’ timeframes, that can be opened immediately, and timeframes that are created by a script into a datafile. I am trading on multiple currencies, and my main EA takes decisions by looking at different distances to the market, I need at least 3 timeframes for each currency. When I realised that an indicator is able to take any of the enumerated timeframes BUT returns 0 if it’s not M1, M5, M15, M30, H1 etc, I was so disappointed. MT4 isn’t even able to return an error message to state the chart isn’t available. This article is very, very useful. Thank you. EAs work with offline charts, you just need to go to the chart Properties (F8) and deselect the “Offline chart” box under the “Common” tab. For some reason Metaquotes added this checkbox a few years back. Just uncheck it, and everything should work like it used to. Ok, I have now imported this custom indicator into my Oanda MT4. If I attach it to a chart, nothing happens. No error message. No message in logs. Is it really compatible with MT4? as I see it was written in 2005. Hello again Sylvain. Yes… the old indicator I had up on this page stopped working with some of the newer builds of Metatrader 4. I’ve updated this page a few times, though. The current indicator is working fine in the newest builds. Hi, I have MT4 build 765 using the built in periodconverter script. The problem is the script gets removed when I close the platform. Is there a way to keep it on the chart when closing and reopening MT4? I know I confused some folks, because I was recommending that traders temporarily use the built-in PeriodConverter in MT4 while I found a suitable replacement for the old indicator I had up here. Unfortunately, the built-in script has to be reapplied to your charts each time your reopen the platform, or even switch profiles. The new indicator that I’ve added to this page fixes that problem. Hopefully Metaquotes will add a built-in period converter indicator in the future, so that I does not need to be reapplied over and over. Better yet, let us just create custom time frames by default. thanks for the reply. Its been a while since I’ve used that script, but I sure thought it stayed when opening and closing the platform. And thanks for the conformation I’m not going bonkers… yes hopefully this will get fixed. Maybe removing this script on close is by design, anyway to confirm that? You’re right… the old indicator that was on this page was basically the built-in MT4 period converter script that someone had turned into an indicator. It used to remain attached to a chart after reopening, because it was an indicator. All scripts are removed from your charts when you close charts, switch profiles, or exit the platform. I’m not sure why they don’t just allow you to keep scripts attached to your charts. Sometimes I think they don’t want it to work too well, because they want us to switch to MT5. I would be fine with that, BTW, if I could get the few indicators and EAs that I need to work in MT5. My broker needs to support it too, because I want to continue trading from my charts. Good news! I found a script that doesn’t need to be reapplied each time you open MT4. I’ve uploaded it to the site, and linked to it in the updated article. yep, script dropping is a pain – Have set up snapshots of 12 charts each with a different pair as an overview on M3, based on M1 multiplier of 3, and have to reload script on all 12 charts. I would be interested on updates if this is solved. I’m glad I could help. I’ve been meaning to do this update for a while. Yes. It can be. I address that in my updated article. I only group 3 time frames for a single currency in each of my profiles that use the Top Dog Trading setup. You probably just have too many charts open at once. You might try saving a handful of them in separate profiles or something similar. No. Sorry. There was a script floating around, but it was impractical for me to use. You had to let the script rebuild the chart every time you restarted MT4. I may eventually try to find it again (or something similar), and put it up on the site. Edit: I’ve added a tutorial on how to create custom tick charts in Metatrader 4.
yes too many charts open! (the P4L ….. 509 indicator). I am just after a market overview various pairs so I can quickly zero in on what I wish to trade. Hi Chris, Had to open up data files and set aside half of the charts at a time in the profile so I could re-open platform and regain control to do adjustments. My indicator set up also resource hungry. A little bit here and a little bit there have optimised everything. I have adjusted the refresh rate to 3000 ms, stripped all my charts down to bare minimums, and split one profile into 2 – and now it is acceptable. Thanks for pointing out the indicator in pref to the script. too many charts to refresh the script each time. You have provided really good service to people over many years – champion! Thanks for the kind words, Peter! I’m glad you got it working for you. Good luck, and thanks for reading. Do you have any experience with renko charts? On old versions I could just add a renko ea on 1m chart and would automatically generate m2 offline with renko chart) but since the new version the ea doesn’t generate m2 and when I use the scrip to generate m2, renko is missing. No. Sorry. Unfortunately, I don’t have any experience with renko charts. hai, Chris.. just a question..
do you know anything about backtesting? can u explain how to do it? I don’t use MT4’s built-in backtesting, because all of the trading systems that I use are manual systems. Edit: I’ve written an article on manual backtesting tips. Thanks for the kind words, Jono. Yes, it’s annoying to reapply the script over and over again. I’m glad I found this one, and I’m glad you found this article useful. I agree on data feeds. Although, for the kind of trading that I do (mostly swing trading), I doubt that I would see much improvement with a better feed. Any idea as to why when using P4L PeriodCon 509 when using 1 minute data and creating say 30 or 60 min data, the data created starts at 10:00 am and ends at 23:00 pm? Where is the rest of the hours between 23:00pm and 10:00 am? I have no idea. I can’t say that I’ve ever encountered that problem. It’s not necessary to use the 1 Minute chart to get accurate results with this indicator. Just apply it to a longer time frames, if you need to, to get longer custom time frames. Hi Chris, I drag this onto my chart in mt4 and nothing happens at all.. tried a few times..
Are you checking “Allow DLL imports”? I’m not sure what the problem is. Try the built-in script in MT4. If you can get that to work, this should also work. Thanks for commenting. If you’re compiling, you didn’t download the indicator from this site. I’ve uploaded the ex4 precisely so we wouldn’t have to compile. The mq4 file doesn’t work. The ex4 file still works on the newest mt4 builds. Just download the indicator from this page, delete or remove the one you have in your MT4 installation, and you should be good to go. Hey bro.. uploading the mq4 file will make me happy.. and i can also make more tune in that.. I didn’t have the mq4 file before, but I found it recently. If anyone wants to try and update it for us, leave me a comment. I’ll send it to the email address you use. FYI, the ex4 file still works for now. I’m still using it. Converting a m1 Chart to a e.g. m10 Chart worked very well. How can I store the new m10 data list as a csv-file? (when pressing F2 always the timeframes of the historical data of the Broker will appear, missing m10). The script and indicator mentioned above both create modified offline charts. I guess, when exporting to a csv file, offline charts are not available. I’m not really sure if that’s the problem, but that would be my guess. I’ve never tried to do this. I found so useful this period converter, thank you. My only problem, that I do not know how can I use this for EA in offline charts? There is not possible to select M2 timeframe in the Strategy Tester built-in MT4. Sorry Attila. I’m not sure. Have you tried deselecting the “Offline chart” checkbox under “Common” in your offline chart’s Properties (F8)?. You may have to manually backtest strategies involving your custom time frames. I think you can use custom functions to get desired time frames in your EA, but I really don’t know how that would work in backtesting. I’ve never personally used Strategy Tester with any seriousness. I’ve always been a manual trader. thanks for this solution ! Many thanks for your work, Chris! One question I have though – how could I create multiple offline charts in parallel (all at once), when just applying the indicator to a 1Minute chart once? I have a high number of currency pairs I would like to have created many offline charts against, though I would like to find a way to accomplish the same with just dragging the indicator to a 1-minute chart once, not having to re-apply the indicator each time and then having to manually enter the new time-frame for the offline chart. Can this be accomplished in some way? You can apply the indicator to your 1 Minute chart multiple times. For instance, you can apply the indicator and change the multiplier to 10 to get a 10 Minute chart, and then apply the indicator again, to the same chart, and change the multiplier to 20 to get a 20 Minute chart. As far as not having to re-apply the indicator each time, once you set it up once the way you need it, just save that setup as a profile. That way you can switch away to other chart setups and always come back to that setup without redoing anything. Keep in mind that using this indicator to create many custom time frames at once can slow down MetaTrader 4, so it’s helpful to split your charts into groups in separate profiles if you use many charts. For instance, make a separate profile for your EURUSD, GBPUSD, etc., or separate them by short, medium, and long time frames. I used a combination of the two with the Top Dog Trading system. How do I get 30 second chart with this indicator if I am using 1 minute chart? I think the lowest time frame you can get in MetaTrader is the 1 Minute chart. I believe I tried changing the multiplier for this indicator to .5 before on a 1 Minute chart but it didn’t work. Edit: A reader brought this EA to my attention in the comments above. It creates a variety of charts in seconds. No problem. Thanks for reading and commenting! Thanks for supplying this custom indicator as it is exactly what I have been looking for. Do you have any documentation on how to apply the other inputs in using it. The reason I ask, is that I’m trying to change the candle open time as per one of the earlier comments above, and I’ve been playing around with the time shift and candle shift without much luck. Nt sure what I should be doing here or exactly how it works. I’m also curious about the other settings that refer to inverted etc. Thanks. I’m glad you found this indicator useful. I didn’t create this indicator, so I’m not sure about documentation. You can shift time by hour and minute with TimeShiftAdd_in_HptMM (1.3 = 1 Hour and 30 Minutes forward), or you can shift time by bars with TimeShiftAdd_in_Bars (-2 = 2 bars backward). I’m not sure about the inverted output feature. That may have something to do with exporting your history. You’ll have to play around with it. Thanks for the comment. I’m sorry you’re having a problem. After reading your comment, I downloaded this indicator again and installed it. Everything is working fine, as usual, so it sounds like it’s an issue on your end – maybe a conflict between MT4 and another one of your installed programs. You could try to reapply this indicator to a fresh install of MT4 after backing up your templates and other indicators. I just redownloaded the indicator to make sure everything is working right and it is, so it would appear to be an issue on your end. I think it’s probably one of two things. When you said, “I fresh my chart” it makes me think that you believe the indicator changes the chart you apply it to, but that’s not the case. 1. Be sure to see Step 7. It’s a little farther down than the rest of the steps. In that step, I explain that, after applying the indicator to your chart, you need to find and open your newly created custom chart by going to your offline charts (File > Open Offline). Scroll down to the currency that you applied the indicator to and your custom chart should be in that list (Example: GBPUSD, H2). 2. If you already went through all 7 steps, it’s possible that you missed an important setting. On the chart that you applied the indicator to, bring up your indicators list (Ctrl+I). Select the P4L PeriodCon 509 indicator and click “Edit” to bring up the original menu you saw when dragging the indicator onto your chart. Alternately, you can just delete the indicator and reapply it again. Under the “Common” tab, make sure “Allow DLL imports” is checked. If it isn’t checked this indicator will not work. Let me know if one of these steps solves the issue for you. just downloaded it and followed the steps and it worked fine. thanks a lot. No problem, bizzy. Thanks for reading. I have been a silent reader but I truly appreciate you sharing all this. All your MT4 EA and Indicators have helped me a lot as well as your guide to import data to ForexTester. Thanks for the kind words and for reading. I’m glad I’ve been able to help you. You’re using Forex Tester, so it sounds like you’re on the right track. Good luck! Thank you very much for sharing this excellent tool. I’m trying to use this tool for backtesting purposes where I want to use historical data from an external source. I set up a fresh MT4 instance, connect to a demo account once and then block the connection by defining a non-existing proxy server. Now via the History center, I delete any history data still in memory and use the import button to import my M1 historical data (CSV file). After this, I restart MT4 and use the period converter script to create M5, M15, H1, H4, D1 and W1 data from the M1 data. I also tried to use your tool for this job, as it would potentially save a lot of time running the script time and time again. Unfortunately the indicator gives the error messages: “No offline chart because it already exists: EURUSD,M5 (shift 0min)”. 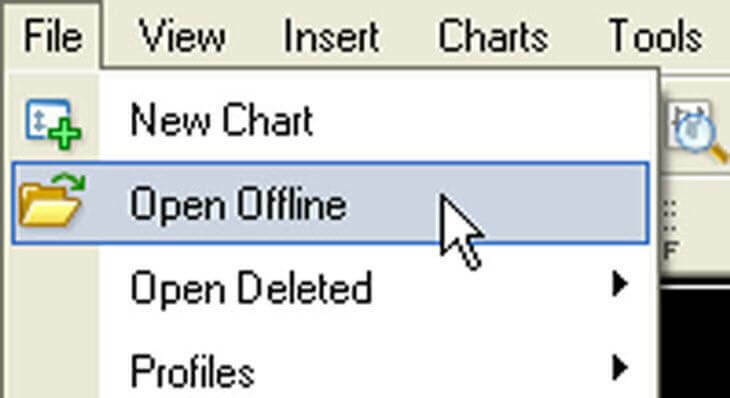 I checked the offline chart window (“open offline”) which shows only the M1 chart. Is there a workaround for this? I do realize that I’m trying to use the tool for something it was not designed to do! Thanks for reading and commenting. I didn’t create this indicator. I just shared it here for you guys because I found it useful. There may be a workaround for what you’re trying to do. Unfortunately, I don’t have any experience doing what you’re trying to do. Sorry, I can’t be more helpful. Good luck! I am trying to set up an EA that runs on 10 pairs and 6 different TFs, which includes 4 offline charts. I have been using your indicator to set up the offline charts, and in doing so it is by far the best indicator I have seen. However, my EA is not taking any trades on the offline charts. My coder has told me that the EA is not receiving the tick data on the offline chart so it is not able to take the trade. During the set up I have restarted MT4 many times, when I restarted MT4 should I reload your indicator onto the charts? I don’t understand the EA not receiving the tick data as I can see price changing on the offline charts. Any help you give me is much appreciated. It’s not my indicator, Fergal. Some EAs work on offline charts and some don’t. It has to do with the code of your EA. A couple of years ago, MT4 got an update from Ansi to Unicode. I’m not a coder, so I don’t know much more than that. If your EAs are using the outdated method of generating a fake tick, they probably will not work. You could try to de-select the “Offline chart” checkbox in the chart properties (F8) of your offline charts. That sometimes works. Aside from that, your EAs need to be updated. Hello, mito. I haven’t used this in a while. I’ll have to take a look at in when the market re-opens. Update: This still works. You did something wrong. Make sure you don’t close the chart you applied this indicator to. In other words, if you applied this indicator to the 1-Minute chart to create a 2-Minute chart, you can’t close the original 1-Minute chart or else your new 2-Minute chart will not update. Can i possibly create a 3min chart with this and set it with indicators that have alerts? Also what will be the timing between the chart and real data updates? Yes, Victor, you can multiply a 1-Minute chart by 3 with this indicator and add any other indicators you want. The timing, as far as I know, is instantaneous or nearly so. There’s not enough of a delay that it would ever affect your trading in any case. I have gone through the above mentioned procedure and now I have H4, M3 and M2 charts on my Mt4 platform. But actually it does not update and the chart does not move. I wonder if there is any way to update the chart? If not what is the use of outdated chart? I just tried this indicator again on the latest build (1090). I downloaded this indicator and installed it per the directions on this page. It works for me. My created charts update in real time. You’re doing something wrong. Remember, you have to keep the chart(s) that you attach this indicator to open or else your created charts will not update. I just have problem when I apply the indicator on the monthly chart and try to create 3, 4 or 6 month timeframes….it keeps creating a candle non stop………. I’m not sure why it does that. I never noticed it before. The longest time frame that I’ve applied it to is the Daily chart to make a 3-Day chart. Thank you Chris. I definitely need time frame converter. Your program is very useful. If I couldn’t find it, I paid to fake developer. Thank you so much again. Do you think this changed offline chart is working with EA? I does not work with. Do you know any reason? I reviewed some comments about time frame converter. I am still curious. If I makes EA working at offline chart , do you think I must open the regular chart with EA first? For example, if I want to use 2 hour offline chart with EA, I must open 1 hour chart with EA? In this case, EA is working on what chart? 1 hour or 2 hours? Sorry for the late response. I’ve been sick. If you apply the EA to a Euro chart, the EA will affect your Euro trade. I’ve had this indicator for a while, but it seems to be factoring in the weekend when there is no trading. For example, I want to create 2 Day charts but it’s factoring in the weekend days of no trading activity, so it’s not accurate. So for example; Friday and Saturday will produce just the “Friday” daily candle instead of the “Friday + Monday” candle. Ive been using it by opening a daily chart and then change the multiplier by “2”. I’ve also tried it by opening a 1 hour chart and changing multiplier by “48”, but the result is the same. This indicator cannot create ticks where your broker has none, so it sounds like the weekend data issue is a broker issue. As for your “Friday + Monday” candle comment: You don’t want that anyway. A combined-day candle chart is wrong. MT4 brokers were known for doing that stupid stuff in the past, but most use charts with a 5-daily-candle week these days. That’s how it should be. It depends on the kind of trading you’re doing, but it’s extremely important in certain trading methods, like candlestick trading, to use 5-daily-candle charts with NY close on the Friday candle. Like I mentioned, most MT4 brokers do use the correct charts these days. If your broker doesn’t, don’t use their charts for trading decisions. Just use them for order entry. You’re just shooting yourself in the foot using bad charts. You can always use another broker’s demo for charting if you still want to use this indicator. I’m not familiar with either of those EAs. To be honest, I’m not the person to ask about MT4’s backtesting feature. I’ve always done manual trading and manual backtesting myself.